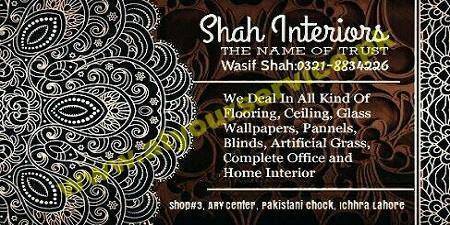 Shah Interiors deals in all kind of flooring, ceiling, glass, wallpapers, panels, blinds, artificial grass, complete office and home interior. Shah Interiors is located in ARY Centre, Pakistani Chowk, Ichra, Lahore. It deals in all kind of flooring, ceiling, glass, wallpapers, panels, blinds, artificial grass, complete office and home interior.